Babs Young writes, Sunrise on Pyramid Point in the Sleeping Bear Dunes National Lakeshore. In the distance are the Manitou Islands. I had to leave home about 5:00 am to get there for the 7:00 sunrise, but it was worth it. It’s easy to see why this park was voted by ABC’s Good Morning America the “most beautiful place in America” in 2011. I remember the beauty contest for places. I wrote about it at the time and I’m not doin’ it again. Instead I’m going to make a nice cup of tea and put Babs’s photo up really, really big on the monitor and watch the sun rise over Lake Michigan. When I rented a Pyramid Point, there was a hang gliding platform right at the point. I wonder if it is still there. Fun to watch the hang gliding. But not tempting. Nice ad with Justin Verlander. When you rented a what at Pyramid Point? In any case, you can still hangglide at the Point. 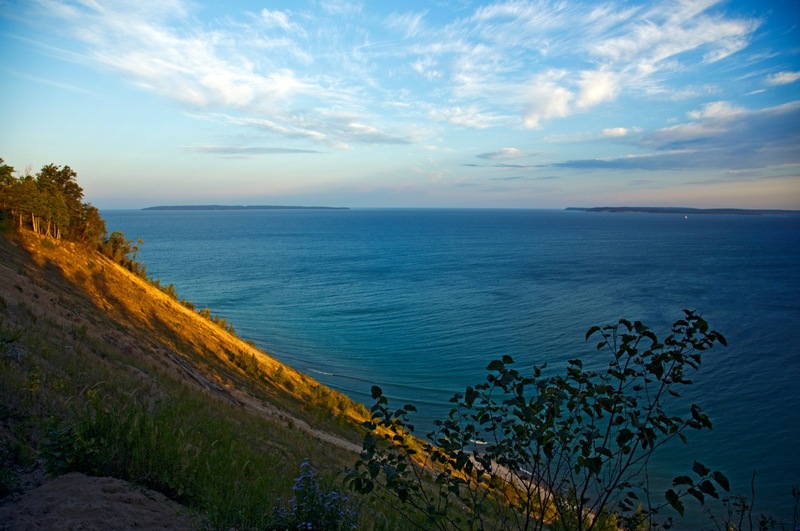 Read all about it at the National Park Service page about Sleeping Bear Dunes. I have discovered the ads rotate. I do not know whether the one that appears is based on a person’s browsing history or on chance. Either way, I am perplexed by them more often than not. I always get so turned around down there. What direction are we facing? I was trying to figure that out myself, because of the splash of sun. I think we’re looking north by northwest, from a perch tucked behind that slope, with the rising sun at our backs. Now we’ll ask Babs. Here’s a map (and a link to a nice blog about hiking – two for one!) that shows the relationship of the Point to the islands. As usual Gerry, you are correct. I’m looking northwest at the Manitou Islands. The sun was indeed coming up to my back. The light did not last long. Some clouds came along and then the sun didn’t come back for about a half hour and we lost the really good light. So this was the best of the bunch. I love it when someone says “you are correct.” That doesn’t happen so very often. For good reason. I’ve sent this off to my friend who swore she was only going to Minnesota and perhaps a little Wisconsin, but who in fact landed at Sleeping Bear Dunes. She kept trying to tell me about it, and finally just gave up. “Words won’t do”, she said. I can see why. It’s so, so beautiful. If that’s a sailboat out there to the right, I’m doubly envious. I’m wondering if that’s a point we’re looking at. There doesn’t seem to be much wind, but it looks as though something is shaping the waves. Since I don’t do lake sailing, I don’t know – are there currents in the lake, too? I’m puzzled by the reference to the ads. Is there one of this page? I don’t see one. It’s not that I want one, you understand, but if they’re supposed to be here and aren’t, I guess you should know. I’m glad you like it. I like it too. We are spoiled for choice. I’m no sailor, but I’ll see if I can find someone to discuss these matters with you properly. The Great Lakes are always in motion, even when the wind is gentle. I can stand on the shore and see that the wind is changing before I feel it, because the wave patterns change and cross each other. It’s very absorbing, watching water. Ads not so much. They appear, but not to WordPress members who are signed in. Bruce Laidlaw often updates me on whatever he sees. If you sign out and then go a blogging, you will see them too. The “best of the bunch” is stunning! Husband and I hiked Pyramid Point in June this year. What a great view. Will be doing it again I’m sure. I hope so. You ought to try it in autumn. Assuming we have an autumn. We seem to be compressing seasons. Well heck yes. But I ask myself, is it worth my getting up at 5 am myself? I am still thinking about that. Gadz, the intensely blue water — lovely. Looking at the blue, blue lakes is one of the best things about living here. I’m glad you liked it. I was confused too. I have never considered the possibility of seeing a sunrise on Lake Michigan, especially from sleeping bear…very cool, very beautiful and well worth getting up early! Belated hello, Dawn, Karma – some days I’m glad to find that I’m out of bed and on the road at all, but you’re right, there are wonders available in the early morning. So beautiful ! This golden shade falling into the deep blue waters is worth getting up very early indeed. And those clouds ! It seems unreal. A gorgeous picture and moment. Ah, thank you Isabelle. This is what we have instead of mountains. We make do. I love the lakes with all my heart.